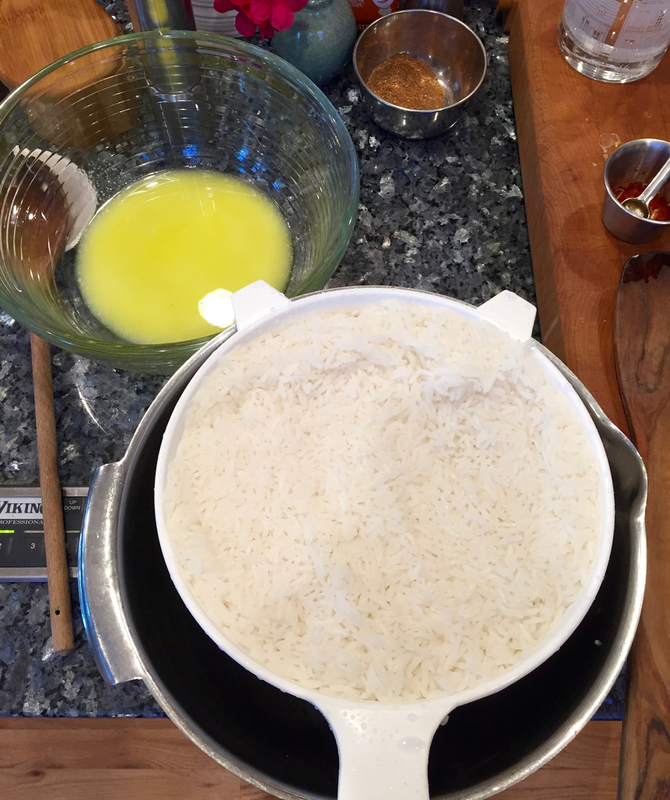 Circling back to my previous post about the marvelous coincidence in being given two versions of the same cookbook, Food of Life, I wanted to share some photos of the vibrant, flavorful kuku and my second attempted dish, chicken with rice and apricots. Both are really delicious, and I'd say my first efforts were resounding successes except that the kuku fell apart (it's supposed to hold firm so that you can slice it, rather like a frittata) and I could not dislodge 75% of the prized, golden shell layer of the rice dish (the tah-dig, a crust that forms as the rice sort of caramelizes in the pot). So be it. We still enjoyed these meals and in fact have enjoyed them for days as Food of Life's "serves 6" appears to actually mean "serves 6 with ample leftovers." This is all good because we are a leftovers-loving family. While the colors of the kuku are magnificent, and the zucchini and parsley tasted as bright as they look, you can see that what was supposed to be a slice is little more than a spooned slop atop some crisped pita. Whatever. It's like when I'm teaching a canning class and we're making anything with strawberries, I always say "Listen, if your jam doesn't set perfectly, just call it sauce and move on. Who's going to be like, 'Strawberry sauce? No good!' Exactly. No one." So anyway, back to the food. I really liked the kuku and would definitely make it again. It was fresh, light and yet hearty, and healthy. Two nights later, I ventured into a more time-intensive recipe, the chicken with rice and apricots. I do not mind putting in effort, but I'll tell y'all that this dish takes a long time. Like three hours long. Let's all give it up for Persian mamas and all other cooks who daily craft such layered meals. Mahgah. First you prepare the chicken by cubing it and cooking it -for nearly an hour!- with onions and turmeric and other lovely things. 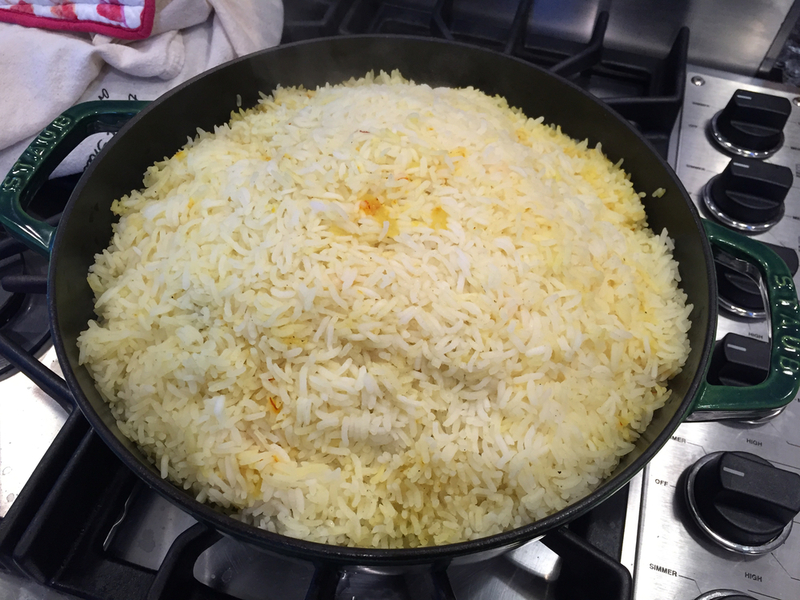 Meanwhile, you will optimally soak the rice for two hours and also prepare the onion, apricot, date and golden raisin part of the dish. The spices are divine: cinnamon, nutmeg, coriander, cumin, saffron, rose water, advieh (a Persian blend of many of the spices I just mentioned plus dried and ground rose petals), and turmeric. I would like to take this moment to give a shout-out to turmeric. It makes everything such a smashing shade of orange-yellow and its purported health benefits, including being an effective anti-inflammatory and powerful antioxidant, are fantastic. Not only do both dishes make excellent leftovers, the chicken and rice dish actually improves after a day or two! And, I got to use up the bottle of rose water I've had on hand for a while now.